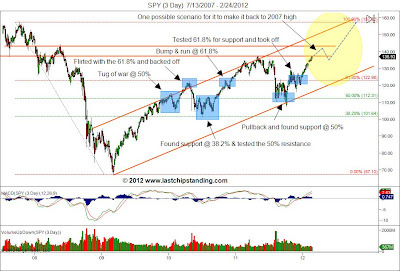 Here is my chronicle interpretation on how the SPY got to where it is and a possible scenario on how it might get back to the 2007 high. Not much has changed for the SP500. Continue to look for a break above 1370 and a possible move up to test the 1425-1430 level. The market continues to move higher and just won't let the bears escape. It teases the bears by continually doing small sell off just to lure them to short into this market, then the market reverses and move higher to trap them bears. 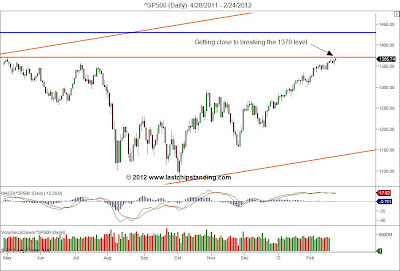 The SP500 is near breaking above the 1370. After breaking above the 1370, the next major resistance level will likely be 1425 near the 2008 high. Here is a video highlighting the possible level for the SP500, and three stocks; VRSN, SNDK, and AA that are breaking out of its base. Click on the full screen icon to view the video in HD. A quick look at AAPL to see what it might do in the near term. click on the full screen icon to view it in HD. During the end of last week, the market shown some signs of fatigue and gave up some of the previous gains. But looking at the intraday chart, one can also see there seems to be some buying into the close. This minor pullback the market did could due to the weekly options expiration. 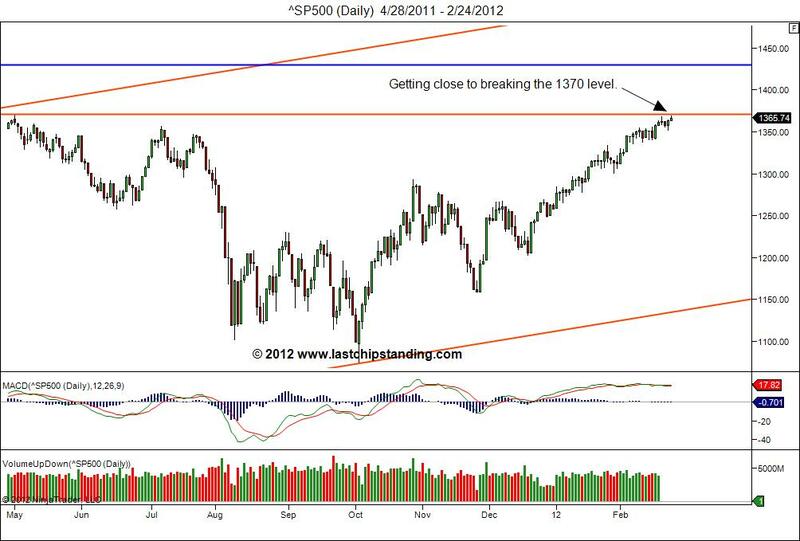 From the price action of the SP500, it has not indicate it will pullback to below 1300. But anything is possible, and until it has retreated below 1300, I will continue to trade as the trend is still 'up'. Here is a short video reviewing the SP500. Click on the 'full screen' icon to view it on HD. And for those email subscribers that do not see the video player on their screen, please click on this link or go to www.lastchipstanding.com to view the video. For email subscribers, click here to view the video. A short screencast video at StockTwits on GS. 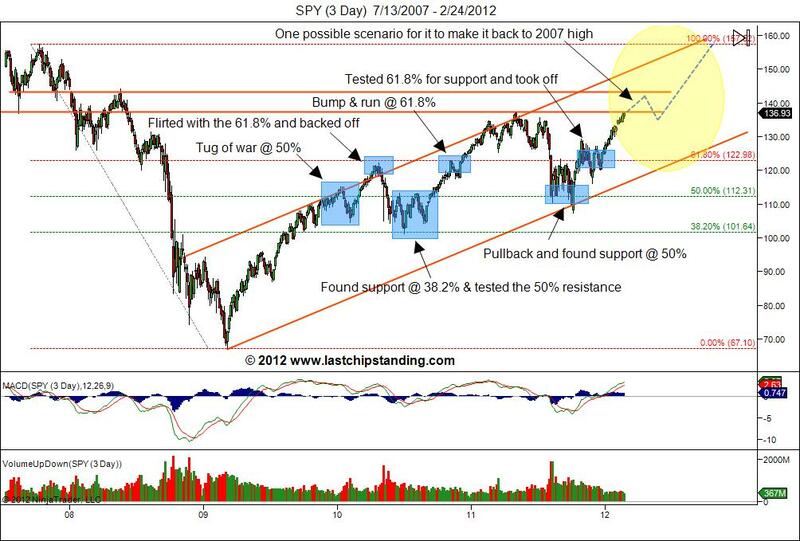 Click here to view the video to see what are some of the potential swing trade levels. The market continues to remain strong, and here is a short video reviewing a few stocks I have mentioned earlier: BAC, HPQ, DELL, MCP, AVL, PHM. Click the full screen icon on the video player to watch it in HD. Click here if you need to go directly to the video.